A delicious light coffee cake, leavened with a little bit of yeast, but with no kneading required! Great served warm from the oven and best on the day it is made. Also freezes well. 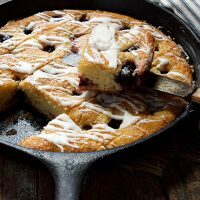 Lightly great a 10-inch skillet (8 inches across the bottom/10 inches across the top) or an 8-inch round or square baking pan. Set aside. In a small saucepan over medium heat, warm the milk, brown sugar and butter until warm to the touch, and the butter has almost melted. Remove from heat and stir in the yeast. Let stand 5-10 minutes, until foamy. In a large bowl, whisk together the flour and salt. Add the eggs and the milk/yeast mixture and gently stir, mixing just until the wet ingredients are incorporated. Add the batter to the prepared plan and cover with plastic wrap that is sprayed with cooking spray on the underside. Preheat oven to 350 F. Place the pan in a warm spot in your kitchen and leave it to rise for about 45 minutes - 1 hour (I like to set it on top of my pre-heating oven). *Note: If you want to make the night before for enjoying in the morning, you can refrigerate this for up to 8 hours, then bake up. When dough has risen, remove plastic wrap and evenly distribute the cherries over-top. Sprinkle with turbinado or brown sugar, then drizzle the melted butter over-top. Bake in the preheated 350 F. oven for 30 minutes, then reduce the heat to 325 F. and bake a further 10-15 minutes, or until the top is golden and the sides are pulling away from the side of the pan. While the kuchen is baking, make the glaze by whisking together all the ingredients until smooth. Drizzle the glaze over the warm kuchen and serve immediately.